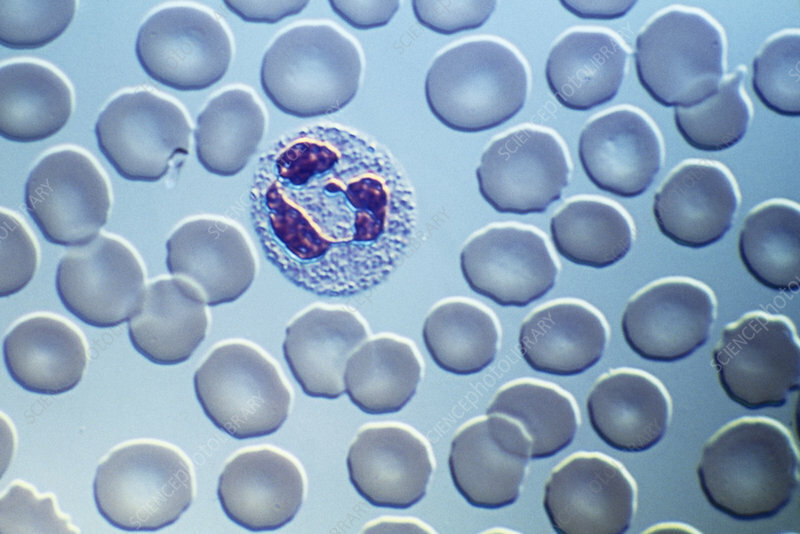 Neutrophil blood cell. Light micrograph of a neutrophil leucocyte (white blood cell) surrounded by erythrocytes (red blood cells). The neutrophil (centre left) has a characteristic lobulated nucleus (purple). This usually consists of five lobes connected by fine strands of nuclear material. In the neutrophils of females the cell's condensed X-chromosome or Barr body is occasionally visible as a drumstick-shaped appendage. This is known as the drumstick chromosome and is seen here on the lobe at right. Neutrophils are the most common white blood cell and they engulf and digest invading microorganisms. Magnification: x800 at 35mm size.